In Eric Deis’ 43′ x 32′ photograph, the image of a small house is framed by a large cedar tree on one side and condominium sales office on the other. In the background, the presence of a residential tower suggests a similar fate for the little house at 1062 Richards Street. The photograph was taken just months before the owner ended her resolute stand off and sold her home of 45 years to make way for advancing development. Echoing the current rapid migration of construction sites from one street to the next throughout Vancouver’s downtown core, Deis has transplanted Last Chance to the 700 block of Hamilton Street. Using a printing medium commonly associated with full colour advertising and real estate marketing, Last Chance asserts a distinctly quiet, black and white presence. Its scale suggests a distant view yet focuses upon a recent past. 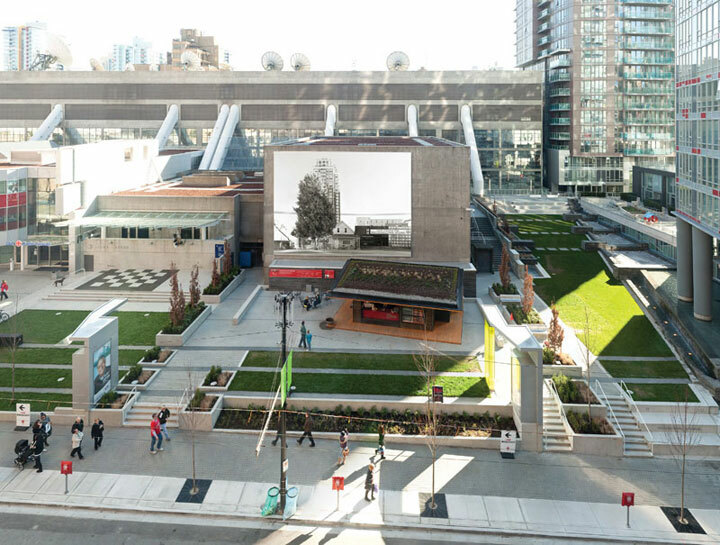 Compressing into one image the last house, the last tree, and the last chance for preconstruction pricing, Deis’ photograph captures a somber and familiar moment of transition in Vancouver’s built environment. Eric Deis is a Vancouver-based artist who has exhibited in North America and Europe. His minutely detailed large-format photographs expose extraordinary moments hidden within regular circumstances. Other Sights for Artists Projects gratefully acknowledges the support of the City of Vancouver. The artist gratefully acknowledges the support of The Canada Council for the Arts.